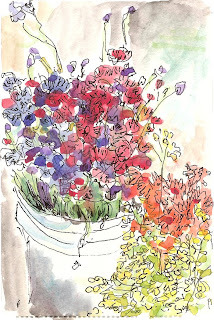 Here is the sketch I had the most fun with at the Lake City Farmer's Market on June 18, with Frances and then Dave! This flower seller had the most beautiful peonies, but peonies intimidate me. I was happy to stand there drawing these lush beauties, and the seller came and talked with me too. Fun! Just to get us all in the mood, I'll throw in last month's goose from Fishermen's Terminal .